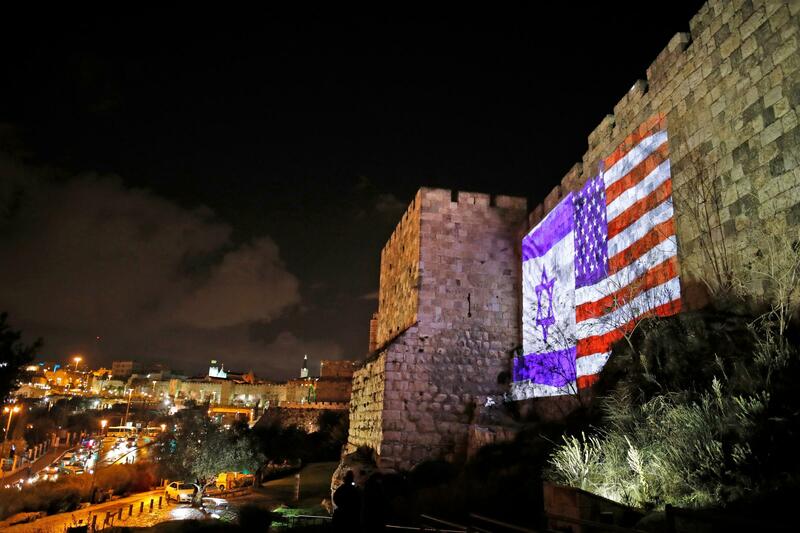 The American and Israeli flags are on display Wednesday on the walls of the Old City of Jerusalem. President Trump announced that the U.S. will view Jerusalem as the capital of Israel, and he ordered the State Department to "begin preparation to move the American Embassy from Tel Aviv." The controversial move threatens to unsettle the region's volatile politics. The government of Israel considers Jerusalem its capital, and most Jewish-American organizations have long argued that the United States should acknowledge it as such. The 1995 Jerusalem Embassy Act, which called for the U.S. Embassy to be moved to Jerusalem, passed by a large bipartisan margin and was strongly supported by Jewish-American groups. "It's been the consensus mainline view for decades," said Nathan Diament, executive director of the Union of Orthodox Jewish Congregations of America, "because Jerusalem is the capital city for Israel and the Jewish people. ... The United States puts its embassies in capital cities, and it's unjust and discriminatory to say we're going to single out Israel as the one country where we don't put our embassy [in the capital]." When President Trump on Wednesday ordered the State Department to begin preparations to move the embassy to Jerusalem, several Jewish-American groups welcomed the move. "By stating the truth of Jerusalem's status as the capital of the State of Israel, President Trump has asserted U.S. global leadership towards ending a longstanding, senseless anomaly," said David Harris, chief executive officer of the American Jewish Committee. The Anti-Defamation League, while urging a "rapid resumption" of peace negotiations, called the move a "significant step," coming at a time "when international organizations and other detractors delegitimize the Jewish state and deny any Jewish connection to the holy city." But there were also misgivings from some Jewish-American groups. The Reform Jewish Movement, representing nearly 900 congregations, noted that it has long supported the recognition of Jerusalem as Israel's capital but also believed that moving the U.S. Embassy there should happen only "at the right time." Without a comprehensive peace plan, the movement said it cannot support the president's decision to move the embassy now. Conservative evangelical Christian leaders had fewer qualms. "This decision will be met by political praise and theological conviction," said Johnnie Moore, an informal spokesman for Trump's evangelical advisory group. "Evangelicals in every corner of the United States will be ecstatic," he said. Evangelicals feel a special kinship with Jerusalem as the city where they believe Jesus Christ was crucified and rose again. Some sects even take an eschatological view, arguing that Jesus will return to Earth in Jerusalem, once all Jews are reunited there. For Trump's evangelical advisory group, said Moore, the only issue more important than the status of Jerusalem is the question of who will be appointed as federal judges. "In our various meetings with the White House, this issue has always come up," Moore said. "And it has always been an extended discussion around the table. I mean, at the heart of the relationship between the United States and Israel has been the friendship between evangelical Christians and the Jewish people." Some evangelical leaders who generally support the president's Jerusalem decision, however, fear the repercussions for their own Palestinian Christian followers. Muslim leaders in the Palestinian territories have warned there will be a reaction there to the president's announcement. The governments of Saudi Arabia, Jordan and Turkey all expressed alarm at Trump's decision, as did Muslim leaders in the U.S.
"The reality is that Palestinians have existed for generations on the land of Palestine [and] in Jerusalem," said Osama Abuirshaid, a board member of the American Muslims for Palestine, at a news conference near the White House. "[Trump] cannot deny this reality," Abuirshaid said. "He spoke about the Jewish connection to Jerusalem while negating the Christian and Muslim connection to the land and to the holy city." Pope Francis advised against "adding new elements of tension in a world already shaken and scarred by many cruel conflicts." The heads of several Christian churches in Jerusalem, in a joint letter to Trump, said a unilateral change in the status of Jerusalem by the U.S. government "will yield increased hatred, conflict, violence, and suffering in Jerusalem and the Holy Land ... [and] cause irreparable harm." A similar warning came from Elizabeth Eaton, the presiding bishop of the Evangelical Lutheran Church in America, the largest Lutheran group in the U.S.
"This announcement," Eaton said, "has a high probability of leading to violence and bloodshed and not ... getting any closer to having the two parties come to the table again." Eaton spoke following a meeting in Geneva with fellow Lutheran chuch leaders from around the world, including those in Jordan and other Arab countries. Jerusalem is a holy city for Jews, Christians and Muslims. So it's not surprising that religious leaders from all those traditions have strong feelings about President Trump's decision to recognize Jerusalem as Israel's capital. NPR's Tom Gjelten reports. TOM GJELTEN, BYLINE: Jewish organizations were solidly behind a 1995 law that called for moving the U.S. embassy to Jerusalem. Nathan Diament, executive director of the Orthodox Union of Judaism, says it's long been a consensus Jewish position. NATHAN DIAMENT: Because Jerusalem is the capital city for Israel and the Jewish people, because the United States puts its embassies in the capital cities, and it's unjust and discriminatory to say we're going to single out Israel as the one country where we're not going to put our embassy. GJELTEN: When President Trump officially recognized Jerusalem as Israel's capital and ordered preparations to move the embassy there, several Jewish organizations welcomed the move, among them the American Jewish Committee and the Anti-Defamation League. But there were also misgivings. The Reform Jewish movement noted it has long said that Jerusalem is Israel's eternal capital and that the U.S. embassy should be moved there but only at the right time. Absent a comprehensive peace plan, the movement said it cannot support moving the embassy now. No such qualms from the most conservative evangelical Christian leaders. Johnnie Moore is a member of President Trump's evangelical advisory group. JOHNNIE MOORE: This decision will be met by political praise and by theological conviction, and evangelicals in every corner of the United States will be ecstatic. GJELTEN: Ecstatic - evangelicals feel a special kinship with Jerusalem as the city where Christ was crucified and rose again. Moore says for his advisory group, the only issue more important than Jerusalem has been who gets appointed as federal judges. MOORE: In our various meetings with the White House, the listening sessions, this issue has always come up. And not only has it always come up, but it has always been an extended discussion around the table. I mean, at the heart of the relationship between the United States and Israel is the friendship between evangelical Christians and the Jewish people. GJELTEN: But some evangelical leaders who generally support the president's Jerusalem decision fear the repercussions for their own Palestinian Christian followers. Muslim leaders in the Palestinian territories warn there will be a reaction there to the president's announcement. Osama Abu Irshaid, representing American Muslims for Palestine, says Trump failed to recognize Jerusalem's multifaith heritage. OSAMA ABU IRSHAID: He spoke about the Jewish connection to Jerusalem while negating the Christian and the Muslim connection to the land, too, and to the holy city. GJELTEN: Pope Francis warned against adding new elements of tension in a world already shaken and scarred by many cruel conflicts. The heads of Eastern Orthodox churches in Jerusalem say Trump is causing irreparable harm to the prospects for peace. And from a mainline Protestant leader, this statement by Bishop Elizabeth Eaton, representing the largest U.S. Lutheran group. ELIZABETH EATON: Making this announcement I feel has the high probability of leading to violence and bloodshed and does not have an immediate possibility with getting any closer to having the two parties come to the table again. GJELTEN: Eaton made that statement having just met in Geneva with fellow Lutheran leaders from around the world. (SOUNDBITE OF KOLOTO'S "PRIMER") Transcript provided by NPR, Copyright NPR.